Swing Tower ride is a novel flying tower type amusement park equipment which is designed and developed by Beston company. Its runing characteristics are: the turntable moves up and down linearly under the action of the traction cable and the turntable simultaneously performs circular motion. Passengers seat of the swing tower ride is hanging on the turntable with a chain. And the passengers seat is made by the combination of the rotation and the up and down movements. The chair of the swing tower ride spins around the column under the action of the centrifugal force, bringing endless fun to the passengers. 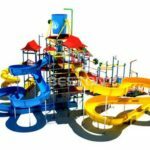 Welcome to buy your new amusement park swing tower rides from our factory for your amusement park in Australia. The swing tower ride belongs to the thrill rides, but it also suitable for all ages. It combines entertainment, fun, thrill and excitement, and is luxuriously decorated, making it a highlight for the amusement park. The towering towers can not only become a landmark, but also become a beautiful ride for amusement parks when the night comes, with colorful lights and more dazzling and magnificent. The thrill swing tower ride is installed in a fixed form. The height of the swing tower ride is 38 meters, the middle sliding frame extends 18 cantilevers, and 36 tourists are seated in the double seat at the cantilever end. As the sliding frame rotates slowly and slowly, the speed is from the passenger’s feet. After leaving the ground, it is getting faster and faster. The passengers are dispersed in the air. 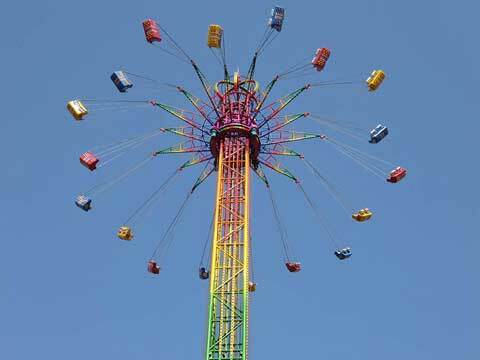 After about 30 seconds, the passengers are taken to the height of 27m and fly at a speed of 50km/h. After a period of time, they will fall again, and the rotation speed will slow down, so that passengers can return. To the ground. Passengers enjoy the high-speed flight and enjoy the surrounding scenery in the high air throughout the game. Large swing tower ride is a large-scale flying tower-type amusement facility developed by our company according to market demand. Adopting the company’s technology, the structure is grand, the decoration is simple and elegant, and the play effect is excellent. The passengers are hung on the turntable with the ring chain of the seat, and the rotating and the combined movement of the upper and lower sides simultaneously make the passenger feel the endless pleasure of the rotating centrifugal force and the running height. This technology has changed the complex structure and high cost of such amusement equipment, which has greatly reduced the purchase cost and reduced the operation and maintenance cost. It is a landmark amusement ride that integrates entertainment, thrill and excitement. The company’s high-altitude flying products are divided into 55.8 meters, 43.8 meters, 31.8 meters. At night, its towering tower is more distinguished in the amusement park; the colorful lights, in the rotation of the passengers, are like a rainbow of dancing, more dazzling, colorful and colorful. Get your new swing tower ride from Beston Company now for your park in Australia.